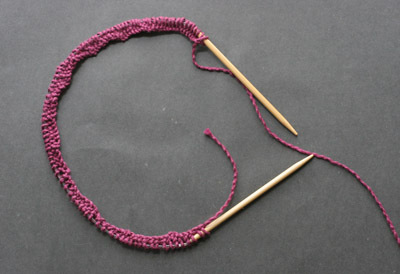 Knitting on circular needles is called Knitting in the Round. You cast on to your circular needle in exactly the same way that you cast onto straight needles. The first row is the hardest. You MUST be sure that when you join the yarn that it doesn't twist around the needle! Turn your cast on stitches so they are all facing the same way. Make a circle with the needle and join the yarn from the LAST stitch you cast on into the FIRST stitch of the cast on row. Hold your needle so that the yarn is coming from the right. Pull the yarn on the first few stitches tight so there won't be a hole, or gap, where you have joined the work. Use a stitch marker to know where your piece began so you will know where the row ends and the next one begins. TIP: As you continue to knit you'll see that the right, or Knit side is on the outside and the wrong, or Purl side in on the inside. 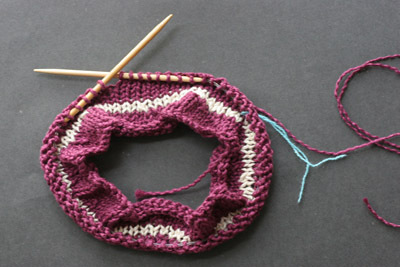 Patterns are easy to see when you knit in the round as they show up on the outside.